Western Railway has published a Advertisement for below mentioned Posts 2015. Check below for more details. For application form and other details, refer Employment Notice No. 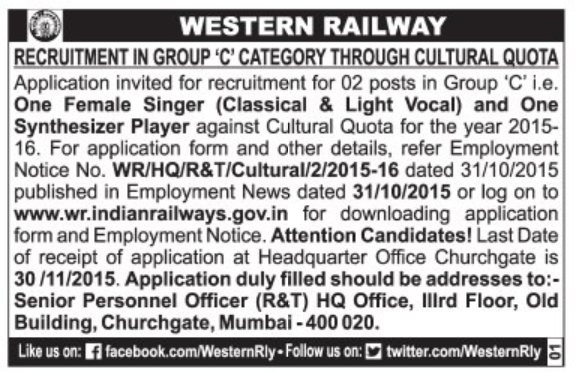 WR/HQ/R&T/Cultural/2/2015-16 dated 31/10/2015 published in Employment News Paper 31st Oct 2015 Issue. How To Apply: Completed Application (prescribed format)should be reach to SENIOR PERSONNEL OFFICER (R&T) HQ OFFICE, LLLRD FLOOR, OLD BUILDING, CHURCHGATE, MUMBAI - 400020 on or before 30/11/2015.